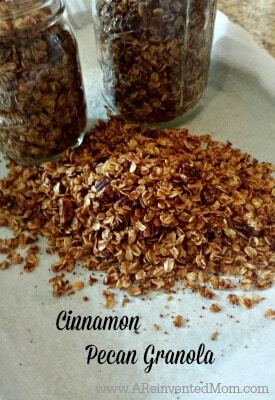 Homemade Cinnamon Pecan Granola is a staple in my home. Granola is a wonderful way to bulk up your morning yogurt, to make granola parfaits and to munch on by the handful if you need a quick snack. Homemade granola comes without the added “mystery ingredients” of the store-bought versions and it tastes 1000 times better, too. You’ll also save a little coin, especially compared to the boutique granolas (these can run up to $10 per pound!). If you have never made granola at home prepare to be amazed at just how easy it is to make with very little prep or cook time required. 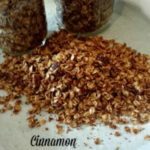 Cinnamon Pecan Granola is my “go-to” recipe. It’s not too sweet, has a hint of orange and pairs so well with fresh fruit, yogurt and ice cream if you are so inclined. Combine salt, cinnamon, brown sugar, orange juice, coconut oil and powdered milk in a small saucepan. Heat over low heat until the mixture is well combined and smooth. Pour cinnamon mixture over oats and nuts. Stir to combine (make sure oats are well coated). Spread mixture on a parchment paper lined cookie sheet. Bake for 40-45 minutes. Stir every 10-15 minutes. Remove from oven and allow to cool completely. Store in tightly covered container. I adapted this recipe from an unknown source (copied from a website years ago). I am happy to give credit to the original source if the source can be determined. Cinnamon Pecan Granola is my "go-to" recipe. It's not too sweet, has a hint of orange and pairs so well with fresh fruit, yogurt and ice cream if you are so inclined. This recipe has been adapted from an unknown source.